What do we have in this chapter 8 part 3? In this section, we'll show you how to register your own service under both the SAP and NTDS name spaces. The Windows NT domain space is quite powerful, which is why we want to include it in our example. However, there are a few features to be aware of before you begin. First, the Windows NT domain space requires Windows 2000 or Windows XP because it is based on the Active Directory directory service. This also means that the Windows 2000 or Windows XP workstation on which you hope to register and/or look up services must have a machine account in that domain in order to access Active Directory. The other feature to note is that the Windows NT domain space is capable of registering socket addresses from any protocol family. Your IP and IPX services can all be registered in the same name space. Also, there is a dynamic way of adding and removing IP-based services. The following code example illustrates the basic steps required to register an instance of a service. For simplicity, no error checking is performed. The example illustrates how to set an instance of a service so that a client of that service can find out the address that it needs to communicate with the service. The first order of business is to initialize the WSAQUERYSET structure. We also need to give a name to the instance of our service. In this case, we simply call it “Widget Server.” The other critical step is to use the same GUID we used to register our service class. Whenever you register an instance of a service, that service must belong to a service class. In this case, we use the “Widget Service Class” (defined in the previous section), whose GUID is SVCID_NETWARE(200). The next step is to set the name spaces that we are interested in. Because our service runs over both IPX and UDP, we specify NS_ALL. Because we're specifying a preexisting name space, lpNSProviderId must be set to NULL. The next step is to set up the SOCKADDR structures within the CSADDR_INFO array that WSASetService() passes as the lpcsaBuffer field of the WSAQUERYSET structure. You'll notice that in our example we actually create the sockets and bind them to a local address before we set up the SOCKADDR structure. This is because we need to find the exact local address that clients need to connect to. For example, when creating our UDP socket for the server, we bind to INADDR_ANY, which doesn't give us the actual IP address until we call getsockname. Using the information returned from getsockname(), we can build a SOCKADDR_IN structure. Within the CSADDR_INFO structure, we set the socket type and the protocol. The other two fields are the local and remote address information. The local address is the address that a server should bind to, and the remote address is the address that a client should use to connect to the service. After setting up the SOCKADDR_IN structure for our UDP-based server, we set up the IPX-based service. In Chapter 4, you saw that servers should bind to the internal network number by setting the network and node number to 0. Again, this doesn't give you the address that clients need, so call the socket option IPX_ADDRESS to get the actual address. In filling the CSADDR_INFO structure for IPX, use SOCK_DGRAM and NSPROTO_IPX for the socket type and the protocol, respectively. The last step is to set the dwNumberOfCsAddrs field in the WSAQUERYSET structure to 2 because there are two addresses, UDP and IPX, that clients can use to establish a connection. Finally, call WSASetService() with our WSAQUERYSET structure, the RNRSERVICE_REGISTER flag, and no control flags. You do not specify the SERVICE_MULTIPLE control flag so that if you choose to deregister our service, all instances of the service (both the IPX and UDP addresses) will be deregistered. There is one consideration that the example does not take into account: multihomed machines. If you create a UDP-based server that binds to INADDR_ANY on a multihomed machine, the client can connect to the server on any of the available interfaces. With IP, getsockname is not sufficient; you must obtain all of the local IP interfaces. There are a number of methods for getting this information, depending on the platform you are on. One method common to all platforms is calling gethostbyname() to return a list of IP addresses for our name. Under Winsock 2, you can also call the ioctl command SIO_GET_INTERFACE_LIST. For Windows 2000 and Windows XP, the ioctl SIO_ADDRESS_LIST_QUERY is available. The following example demonstrates how to advertise, install and register services. 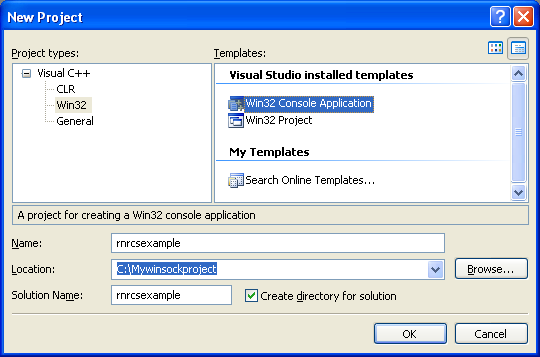 Create a new empty Win32 console application project and add the project/solution name. // name spaces such as IPX and NTDS. // the client needs to do is use that address in either a connect or sendto call. BOOL bServer; // Client or server? // Description: Print usage information. // Description: Parse command line parameters and set some global variables used by the application. // function to return that structure as well. // connection oriented or not as well as what protocols is supports (IPX, IP, etc). // well as the address family of the protocols we support. // SIO_INTERFACE_LIST_QUERY, or the IP helper APIs. // IPX_ADDRESS on each one to find the address. // structures define the interfaces the service is listening on. // that the client can connect to and communicate with the server. // on since we didn't explicitly specify one. // is found, send some data to it. // Description: Read data pending on the given socket. // WSAAddressToString because it doesn't support IPX. // client or server depending on the arguments.